From street to school, this cotton/poly blend earns an A+ with an ultra soft feel. 80% cotton/20% polyester for solid color and 55% cotton/45% polyester for heathered colors. 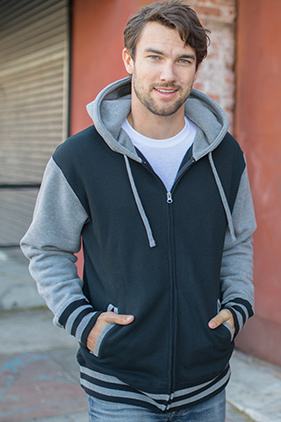 Premium heavyweight 10 ounce fleece with 30 single cotton/polyester blend facing. Jacquard 1x1 rib cuffs and waistband, fleece lined hood, #5 YKK nylon kissing zipper, front slash pockets.